Food storage is great. Storing food storage containers – not so great. I have three drawers filled with various shapes and sizes of food containers. I’m missing more than a few lids. I also don’t like that sometimes I need to dirty up another bowl or plate just to heat something up in the microwave or oven. The solution – Rubbermaid’s new Glass Containers with Easy Find Lids. Now, you can enjoy the organization benefits of the Easy Find Lids system with the versatility of glass. Like other Easy Find Lids products, Rubbermaid Glass containers have lids and bases that neatly nest for compact storage. Lids snap to bases and other lids to make finding the right lid a breeze. Glass bases are designed to stack neatly, which saves space and prevents them from getting stuck together. 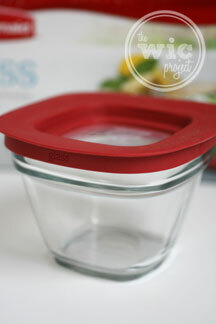 There are so many great things about the new Rubbermaid Glass Containers with Easy Find Lids. I guess the first thing for me is that they’re glass. Glass containers are more durable and frankly, just look better. You could easily take some soup or food over to a friends house in one of these containers and place it on the table without any shame. In addition, because they’re made of tempered glass, the Rubbermaid Glass Containers can do more than just store food. The glass containers (but obviously not the lids) are oven safe up to 425°F – which makes them perfect for reheating lasagnas, baked chicken, or anything that might lose its texture or crispiness in the microwave. Of course, they can be used in the microwave as well, and are also dishwasher and freezer safe. I love that the Rubbermaid Glass Containers with Easy Find Lids were also designed for storage when empty. These four containers stack perfectly to fit onto a shelf, and the lids can snap together and to the bottom of the bowls to make sure they don’t get lost. 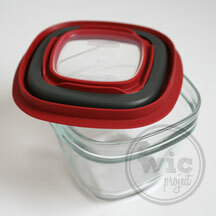 The Rubbermaid 8 piece Glass Containers set comes with four different-sized, square containers and four matching lids. The lids snap down onto the lip of the bowls perfectly. The built-in gasket in the lid makes the seal leak-proof. Since the gasket seals off all four edges, make sure you leave a little bit of room at the top of your bowls when you fill them with food. This gives the lid enough room to fit all the way down and form a tight seal. 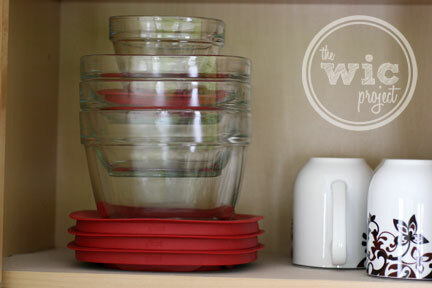 The Rubbermaid Glass Containers really are the all-in-one storage containers that are perfect for your kitchen. You can go from fridge-to oven-to table-to dishwasher, all in one bowl, without having to switch containers or hand wash or anything. It makes food storage and food re-heating simple. If you want to pick up some of these great Rubbermaid Glass food storage containers for yourself, make sure you download this coupon for $1.50 off 1 glass food storage container. You can find Rubbermaid Glass food storage containers in grocery stores, Wal-Mart and Target. You can also purchase them online at the Rubbermaid.com store. One winner will receive a Rubbermaid 8 piece Glass with Easy Find Lids set. 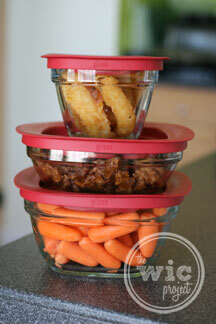 Leave a comment sharing what you like the most about Rubbermaid’s Glass Containers with Easy Find Lids. +1 if you follow Rubbermaid on Twitter. Giveaway ends at 11:59 PM EST, August 10, 2011. I love the sizes, they are perfect for my almost empty nest household! I like the WiC project on facebook, too! I love rubbermaid brand. They are very durable. I like the fact that they fit inside each other to conserve precious cabinet space. I like that they are oven safe. I like that the glass container is easily cleanable and doesn’t stain! I subscribe in a reader: Google Reader. I really like the fact that these are glass. Very nice. i love these containers because i can use them for ANYTHING! simple easy storage organization! I love all the different sizes. and the price for the 8 piece set is not bad either. I like that the bases and lids are BPA FREE! Thanks. I like that the Rubbermaid containers have lids that snap onto the base of the container to keep the two matches together. I have a bunch of the plastic Rubbermaid containers, but would love to start switching over to glass, which is my favorite part of these! I liked Rubbermaid on facebook. I follow Rubbermaid on twitter as carriethegood. I’m your twitter follower carriethegood. I like that they are oven and microwave safe and that I can just one container for making a dish and storing and re-heating leftovers! glass are oven safe up to 425°F- this is perfect. I like that they stack nicely. What I like most is that they’re glass! I’m trying to get away from using plastic so much. Following RubberMaid on Twitter (andreacouponz). Following WiC Project on Twitter (andreacouponz). Following WiC Project on GFC (AndreaH). Subscribed to WiC Project via email and verified (davandihamilton (at) gmail (dot) com). 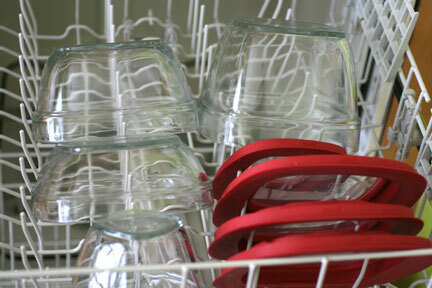 learmed: Rubbermaid Glass with Easy Find Lids™ are safe for use in conventional microwaves. – Use minimum cooking time to heat oil or butter. What I like most is that they are so much cleaner and neater – and long lasting – than plastic. Once my plastic is used for even a short amounts of time, it gets stained and ugly. I follow Rubbermaid on FB. I follow Rubbermaid on twitter @rusthawk. I really like that they are made of glass … making them Eco-friendly. I’m trying to rid my life of plastic which is no easy trick. Thank you for this opportunity! I “Like” Rubbermaid on Facebook (I’m Sml Footprints) & I told them that you sent me. what i like best are the easy to find lids, I’m always losing them! I love how the bowls nest inside each other. I like Rubbermaid on FB! I LOVE these products! The best thing is no more searching for the lids! I like that they are clear and dishwasher safe too! What I will like the most is not needing a separate drawer in my kitchen for all my lids that are jumbled in the one I have now. “Like” Rubbermaid on Facebook username mimi2tnb. “Like” you on Facebook username mimi2tnb. “Follow” Rubbermaid on Twitter @oneinpurpose. “Follow” you on Twitter @oneinpurpose. I like storing my food in glass and not plastic containers. Like WIC project on Facebook. I like the seal most. I like that they are glass, yet still easy to store! I Tweeted- @maxfate Thank you! I luv that they neatly nest for compact storage…not much room in my cabinets. I follow Rubbermaid on Twitter w/ katklaw777. The glass containers are oven safe and can be used in the microwave and are also dishwasher and freezer safe. I like that they snap on so easily. Thanks! I love that it all stores inside itself. We live in a very small house right now and I have no room for anything. This would keep bowls from falling on me when I open the cabinets. I like that they are glass and you can easily see what is in them. I like that they are dishwasher safe! I love that they’re clear…so you can see right through to see what’s in it! My fav thing is that they ARE MADE OF GLASS – this is so important with all of the recent issues with plastic! I like the lids are easy to find. I like that they are easy to store. They’re clear, so I know what I’ve got in my fridge, as compared with my current “storage system” of old margarine tubs which I have to open to find out what I’ve got! I like that the lids are leak proof. I like that it’s safe to go in the oven. i like that they are glass, because now I’m hearing scary stories about the evils of using my plastic storage containers! I most like the fact that you can use the glass containers in the microwave or oven, to cook or reheat food. I like that they can go from the refrigerator right into the microwave. I “Like” Rubbermaid on Facebook. I like that they store so well. I like that they are glass-I prefer to use glass for storage and for reheating instead of plastic. They are also easy to stack & store. I like how organized they are to store! I like that you can see what’s inside the containers! I like that these can be used in the oven. I like that you can use them on both racks of the dishwasher. I also like that they are glass and have no BPA leaking from them. I like that they are glass. I’m reluctant to use plastics around food, especially in the microwave. I love that the lids snap together for easy storage! I like that I can easily see what I have. What I like best is that I’ll be able to see what’s inside not like now with my plastic storage products. the lids are easy to find. I love that the Rubbermaid Glass Lids have the convenience of regular tupperware but they are glass. Since they’re glass, they won’t stain or warp. I make lots of sauces that stain my bowls. I love the way they stack together so nicely for easy storage! I love the way the bowls and lids all stack together. Great idea. What I like most about them is that they are glass. I am discontinuing using plastic so these would be much used for freezing, microwaving etc. I love love LOVE the fact that the lids to the containers snap together for easy storage. That will definitely help with the “lid monster” I have living in my cabinets that eats my lids one by one! I really like that they stack so neatly. I follow WiCProject on twitter. I like that these can go from fridge-to-oven-to table-to-dishwasher! No more cluttering up the fridge with leftovers that have to be put in a separate container in order to be reheated! I “Like” The WiC Project on Facebook (Dara Nix)! I’m following Rubbermaid on Twitter (@Kitty32504)! I am already a GFC follower (Cataroo)! I like the fact that they are glass. I dislike the plastic storage containers. When storing onions is it really hard to get the smell out. I’m not sure what I love most about the Rubbermaid Glass Containers with Easy Find Lids. Since I have a tiny kitchen, I love that they stack so nicely. I also love that they can be used everywhere: freezer, oven, microwave and they’d be lovely on the table for serving, too. I like rubbermaid on Twitter @AsTheNight. I shared on Twitter: http://twitter.com/#!/AsTheNight/status/100916375014477824. I like the fact that they are glass – I can see what I have stored in the refrigerator. Then, when I’m ready to use my leftovers, I just have to take the lid off & pop them in the microwave. I much prefer glass over plastic containers and Rubbermaid products are always high quality. I like that these can go from fridge-to-oven-to table-to-dishwasher! I like that they have a leak proof seal. I like Rubbermaid on facebook as Alison Faith Tolar. I like the WIC project on facebook as Alison Faith Tolar. I have the plastic snap-on lid kind and it really does make it way more convenient to store them. they’re oven and microwave safe! I like that they are glass, since plastic breaks down over time. Plastic always breaks down and glass is so much easier to take care of! You can serve, store and reheat in the one container and not have to search for a matching lid. I like that these can go from fridge-to-oven-to table-to-dishwasher. Following Rubbermaid via Twitter (@Hotsnotty2), Thanks! I like the fact that they are clear glass so I can see what is in them. I’m trying to get rid of plastic and move to glass, so these are great! What I like best is that they are glass. The plastic containers are nice, but you are limited on what you can put in them without staining them up. I like Rubbermaid on FB (Sarah Smile). I follow Rubbermaid on Twitter (mail4rosey). With all the warnings on using plastic in the microwave I am trying to convert to glass containers only for the microwave. These would be great! I like the way the lids fit and the way the gasket seals everything tight. I like that they are made out of glass! Ilike that it seals tightly. I like the glass container with an easy to use plastic storing lid. I am a facebook fan of Rubbermaid. I am a facebook fan of yorus. Sorry my fingers moved too quickly. It should be yours not yorus. Lids neatly nest inside each other for compact organization in your cabinets. What I like most is that they’re glass NOT PLASTIC, which stains. I also highly respect the Rubbermaid brand, they always have great quality items. “Liked” Rubbermaid on Facebook & commented. Following Rubermaid on Twitter @Naddez. Following you on Twitter @Naddez. I like the fact that you can use these in the oven, and then clean them in the dishwasher. I would like to replace all my plastic containers with glass. This would be a great start. I love that it all seems so easily stackable. Way better than my current system! I like how the lids fit. I love that they are dishwasher and freezer safe. Thanks for having the contest! I like that they are all in one from fridge to oven to table to dishwasher. I like the easy find lids!! I am soooo sick of searching for lids!